Language learning IS difficult when done the wrong way! There certainly is a perception “out there” that language learning is difficult. With the prevalence of that belief, one would think there must be some truth to that perception. In fact you can even find hard data to “prove” that belief. Of course one should not jump to hasty conclusions and believe that what we see is actually real, as Plato reminded us in that powerful allegory about The Cave. 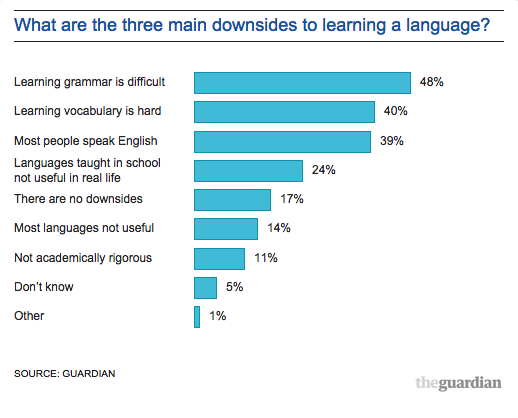 I recently came across an article in the Guardian stating that research by the Guardian and British Academy found that the second biggest issue in language learning that that young people are put off learning languages because they think it is too difficult. The following bar chart breaks that down a bit more. It would not be much of stretch to say that some of the reasons given after the first 2 were given as a justification, rather than fess up to the difficulties experienced. On first sight this would appear that here is more evidence to those who believe that language learning IS hard. Alternatively, it could be said that these figures are actually an indictment on what has been done in the name of language learning. It is incontrovertible that learning a second language should be far easier than learning our first, as our first language must be the hardest language of all to learn. This is because we come to it with no prior knowledge of all that language is and does. We in fact learned it with relative ease without repetition, drilling, grammar study and translation to name a few of the popular mainstream practices. The fact that there are so many fluent bilinguals out there, not to mention the fluent polyglots, provides us evidence that language learning need not be difficult. There are those who point at these success stories and label them as talented or having some special “gene”. This I would suggest is just an attempt to justify the poor results that abound. Amongst the polyglots, I have heard time and time again that many of them only developed their capacities in later years, after struggling to learn languages in schools themselves. Something changed, they dropped the techniques they were taught with and developed new ones…. Bingo! How come it is seems so insurmountable for so many learners? How can all those capacities which we so ably exhibited in our first few years just disappear in a puff of smoke once we go to school? There are a few reasons why they appear to do so. 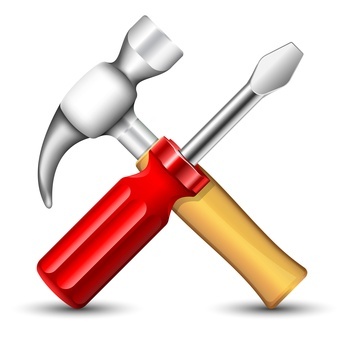 One key reason goes something like this – if we are given a screwdriver to drive in a nail and we are told that that this is the correct tool for the job, (and everyone around us is using the screwdriver) then most of us would become convinced that we are really bad at hammering in the nails. Most I suspect would in fact give up saying things like, “I am too clumsy”, “I have no talent for this” and so on. There would be only a few who would persist and realise that this tool was not the right one and they would find their own, unbeknownst to the others. All the others would see is the result, not how it was done. This would make them even more convinced that the result lay with their own ineptitude. The reason why we see such poor results, and these kind of results are not limited to the UK, is that the strategies and tools used will lead most people to giving up. Find new strategies and tools and the results WILL change. I believe that is just commonsense. This website is replete with the alternate tools and approaches for language learning that transforms the results that learners experience. These suggestions are made about a large range of areas, from how we can learn vocabulary, to how grammar can be approached, to how we need to shift the focus to improving listening and so on! Through all the suggestions made runs a thread that has been all but completely ignored in mainstream language teaching practices. Namely, that everything we do needs to be subservient to the needs of the learner as a learner. Instead, there are numerous activities that make it easy to teach and sell materials, such as exercise sheets. For the learner, they seem to make it easier, but in fact are far removed from what language learners need to do to improve their skills (not knowledge!). Learners need to become more wary about doing the exercises they find in books and on websites thinking that they will improve their ability to use the language they are learning. Some might help however the reality is that most language learners have been led to believe that a diet of comprehension and grammar exercises, gap exercises, word drills and translation practices are the backbone of language learning. These are precisely the practices that typically yield very poor results for most people. There needs to be a change of focus. We need to bring the focus back on improving skills and the way we go about doing that, not on doing more exercises, not on more studying. Just imagine how studying dance moves in a book, then doing exercises on that and then doing tests on that will improve your dancing! It won’t! I am not saying an occasional look in a book is not a good thing. It may well be when it is done to sort out a particular problem. Learning a language is all about learning a skill, not about acquiring knowledge. The belief that by studying a language we can improve our skill is mistaken. Language learning becomes hard when we spend most of our time studying, rather than using the language for what it was intended.